Pink Chevron and turquoise mixed together! This knockout pinwheel bow consists of 17 pieces of 7" strips of ribbon that has various matching colors of pink, lime green and white. The bottom layer is a 2.25" white grosgrain ribbon that will have the long tail in front, great for adding on embroidered monogram initials as shown above. The center is wrapped with a white and pink moon stitch ribbon and it is attached to a French clip. 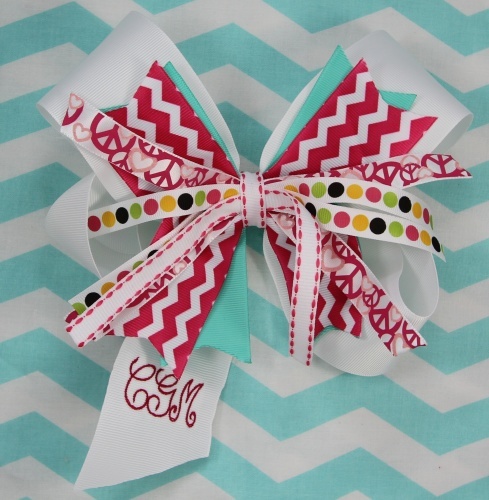 Get this 101 inches of ribbon of Pink Chevron bow to match all your favorite outfits!